The feel of the salt water soaking his beard finally woke Ringo up. He had passed out beneath a wooden boardwalk. Small red crabs crawled over his thick forearms. Pulling himself up, he brushed the mud off his overalls, dislodging a now-dead fish that had somehow come to rest inside his clothes. Shading his eyes from the cruel sun with one hand, he grabbed a thick knot of vines with the other and pulled himself with a groan up onto the boardwalk of Booty Bay, ignoring the smirking goblin guards as he staggered towards the griffon master’s station. 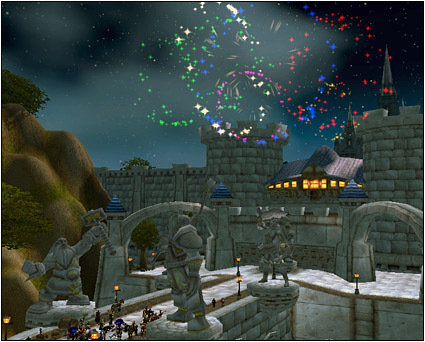 A crowd gathered at the gates of Stormwind to ring in the new year, boisterous with their overflowing mugs and wine goblets. Many familiar faces swirled around me — old friends and new raised their mugs, greeting me warmly as I passed by. I was in search of a good spot for the upcoming firework show, away from towering heads and floppy hats, when me eyes looked upon an old friend I’d never thought I’d see. I was roused from me sleep early morn when Ringo shook the bed as cookie crumbs fell from his beard onto the sheets. Before I could pull the covers back over me head, he tells me that Greatfather Winter has left surprises under the tree! I did not want to fumble around for a clean robe so I grabbed Ringo’s overalls and undershirt on the chair next to me bed and ran to the entrance of Ironforge where the great tree was. 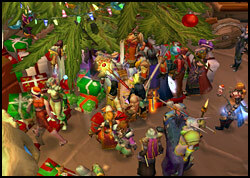 Sure enough, there was a crowd milling around — humans, gnomes, and night elves shaking the presents, trying to figure out which one they wanted. One of the goblins told me I could take up to five presents so I elbowed me way through, accidentally stepping on a few fingers, and snatched the prettiest boxes I could find. I bit off the strings and tore through the wrappings to find five yummy eggnog in little containers, five delicious gingerbread cookies, a little red helper and a mini-snowman! Other folks were winding up their little green helpers, tiny reindeer and snowmen toys so they’d dance and jingle. What a great way to wake up — Happy Winter’s Veil! It’s that time of the year — one of celebration, feasting, and gift exchanging. The Winter Veil is upon us once more! 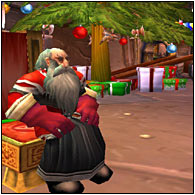 For us dwarves, Winter Veil is a celebration of Greatfather Winter and the snowy blessings he brings to Dun Morogh. As the legend goes, Greatfather Winter would walk Azeroth late in the seasons with winter as his billowing cloak over the lands marking the occasion as a time for rebirth and renewal. 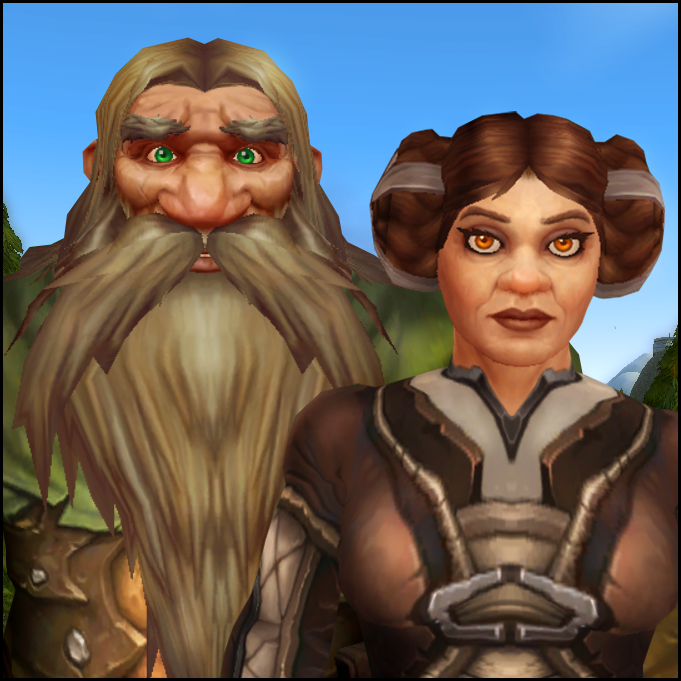 We consider him to be a personification of the Titans, the greatest ancients to ever walk across Azeroth. Ringo sighted down the wooden barrel of the gun. Well, he thought it was wood. It felt like wood, but the barrel — carved in the shape of a long-snouted monster with lots of teeth — shouldn’t be able to stand up to gunfire like this one did, if it really was wood. “Something wrong with the gun?” Beli asked. No one else had wanted to take it from the mare’s saddle sheath, much less try it out.